Rivers State Governor, Nyesom Ezenwo Wike has declared that Nigerians are under obligation to protect their votes to stop the desperate APC Federal Government from rigging the 2019 General Elections. Governor Wike said that the APC Federal Government is now in a panic mode and they are working with security agencies and INEC to rig. 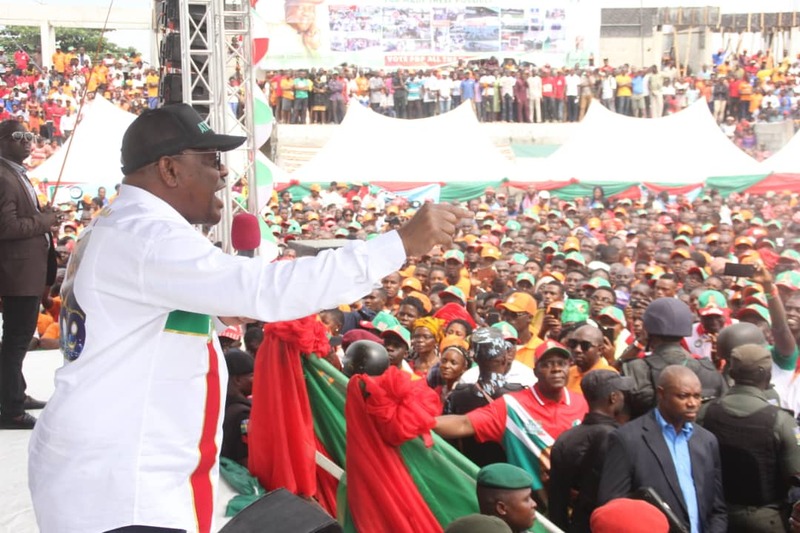 He spoke during the Abua/Odual Local Government Area PDP Campaign Rally at County State School, Abua Central on Tuesday. “APC are afraid because they know that Atiku Abubakar will win fair and square. Therefore they are planning to use the security agencies and INEC to rig. It will not work. He said due to the national rejection of the APC, the party is plotting to cause crisis in order to manipulate the electoral system. He said: “All they are doing is to cause crisis because they are not popular. We want free and fair elections. “These elections, there will be no room for manipulation . If anyone hits you , hit back. Follow them bumper to bumper. APC is desperate, but we will not allow them”. Governor Wike assured the people that he will flag off a key road project in the area once the people overwhelmingly vote for Atiku Abubakar and other PDP candidates. He expressed happiness that the State Government’s investments in peace and security have yielded results in Abua/Odual Local Government Area . The governor took out time to praise the Deputy Speaker of the Rivers State House of Assembly, Rt Hon Marshall Uwom for his consistency. The governor said that Uwom will remain relevant in the state’s political terrain. Rivers State PDP Chairman , Bro Felix Obuah said the flagbearers of PDP in the area have the capacity to continue the develop process. Obuah presented flags to the PDP Candidate for Rivers West Senatorial District, Mrs Betty Apiafi, Abua/Odual/Ahoada East Federal Constituency PDP Candidate , Solomon Bob and Abua/Odual State Constituency PDP Candidate, Solomon Kirife. Speaking, PDP Candidate for Rivers West Senatorial District, Mrs Betty Apiafi said Governor Wike has transformed the area with key projects and programmes. PDP Chairman of Abua/Odual Local Government Area, Ken Wariboko said that Governor Wike is in the area for the celebration of his second term. He said that the Local Government Area is ever intact for the PDP and Governor Wike. He said the people of the area are happy that peace has returned to the area due to the investments of the Rivers State Governor. Chairman of Abua/Odual Local Government Area, Mr Daniel O. Daniel said that the people will always stand with the State Governor . He said that they will speak with their votes. Deputy Speaker of the Rivers State House of Assembly, Marshal Uwom said that the Local Government Area is determined to deliver all PDP candidates. Rivers State Women Affairs Commissioner, Mrs Ukel Oyaghiri said the governor’s achievements will speak for him during the elections.